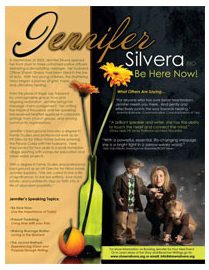 In September of 2005, Jennifer Silvera opened her front door to three uniformed police officers delivering a devastating message: her husband, Officer Shawn Silvera, had been killed in the line of duty. With her two young children, Jordan and Madelynn, the shattering news began a journey of grief, hope and ultimately healing. From this place of tragic loss, followed by unimaginable grace, love and ongoing restoration, Jennifer brings her message of encouragement. Her writing has inspired thousands and her speaking has received heartfelt applause in corporate settings, from church groups, and among community organizations. Jennifer’s background includes a degree in Family Studies and professional work as an HR Director for Hilton Hotels in addition to serving for two years on water projects with the Peace Corps in a small Honduran village. Now introduced as Jennifer Silvera Lindemer, she remarried on New Year’s Day 2011 and added three new joys to her life, husband Steven and two beautiful bonus daughters, Cajsa and Onie. Along with the package came a step-guinea pig named, Tater, and singing cockatiel, Dewey.